Info "Huh?! I thought I locked this… What the --?!" Boarder Patrol is one of Penny's Microgames in WarioWare: Smooth Moves. Its name is a pun on "Border Patrol". 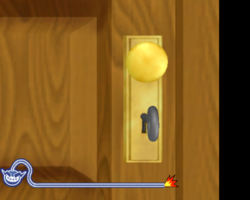 The player has to twist the key clockwise into the keyhole to unlock the door. Behind the door can be various things, such as a hula dancer, a gymnastics man and a thief. 1st level difficulty: 90 degree twist. 2nd level difficulty: 180 degree twist. This page was last edited on February 20, 2018, at 16:00.